Yesterday, XDA guys cracked the S Voice feature from the leaked firmware of Samsung Galaxy S III. The S Voice was tested and it was doing well on Samsung Galaxy Nexus. It will work on all the Android ICS Devices. But today’s point is something better from this. 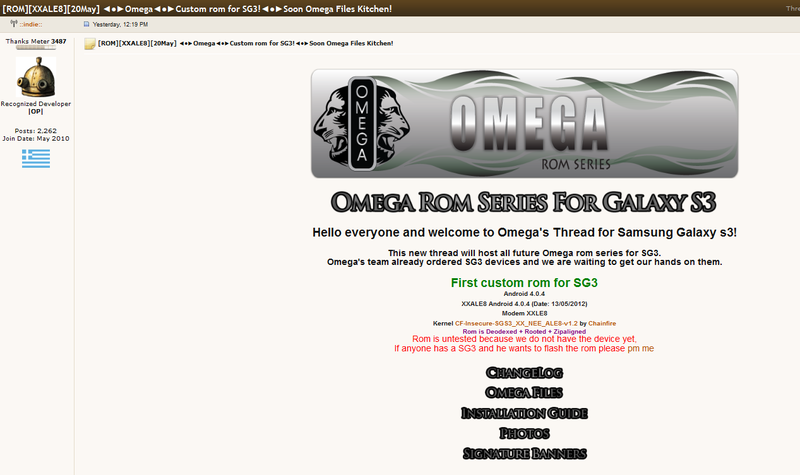 Today Omega, a group of developers on the XDA Developer forum uploaded the Custom ROM of Samsung Galaxy S III. The Device hasn’t hit any of the stores yet. But the leaks have started to come by and spreading smiles on the face of Android Smartphone Users. People who are waiting for Samsung Galaxy S III will have to wait for at least 8 more days before they get a chance to play with the device. But the Custom ROM of Device will let you to experience the software of Samsung Galaxy S III to the most. The Omega Group who has revealed the Custom ROM of Samsung Galaxy S III at XDA Forums said that an Android Smartphone user will be able to use all the features of the Samsung Galaxy S III with this ROM (If your Android Smartphone is powerful enough to run Android ICS). As the Samsung Galaxy S III is all set to arrive in the stores, the people are getting excited about the device. We have already heard about the placement 9 Million pre-orders for Galaxy S III which is way too high than that of Samsung Galaxy S II. In these kind of situation, software leaks of Samsung Galaxy S III is creating more excitement among the people. We won’t be surprised if we see some more software leaks of the device. Though, we won’t be judging the Samsung galaxy S III on the basis of this Custom ROM. We are still waiting for it to arrive in the stores.